There are few companies who can claim they specialize in Air Freight Shipping. Don't take us wrong, there are thousands of companies that ship via Air Freight. In fact you ship your own air freight every day utilizing the services of the big Forwarders, however this is proof that you are just a little fish in the big pond. 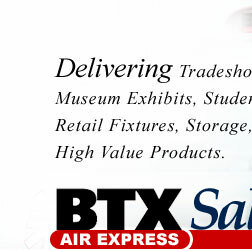 Air Freight Shipping means far more to BTX BTX Salt Lake City then just putting product on a plane. As I just stated, anyone can put product on a plane, the difference is what occurs in several categories between you, your end user and the Carrier from the time that your Air Freight is picked up, until the time that it is delivered. Let me explain. Air Freight shipping to us means that we monitor your shipment every day, all day long to assure that it is traveling as expected. Did it meet every cut off? Is it traveling as the same piece count in which it departed? Was it packed, skidded and prepared properly for shipping? Along with several more issues that are mandatory to be checked within our customer service protocol. Air Freight Shipping isn't just putting it on the plane and sending it on its way. We have come to learn that anything and everything can and will interfere with the integrity of your shipment if we don't maintain a constant vigilance on every job. Air Freight Shipping is calling the origin and destination contacts and verifying the loading and unloading specifications. As well as keeping you, the valued customer in the loop as to each and every step along the way. Which leads us back to our on line web tracking that allows you, and whom ever you desire to be contacted via email every time we update the progress on the web. There is a difference in Air Freight Shipping.. Give us a call and enjoy it for yourself! 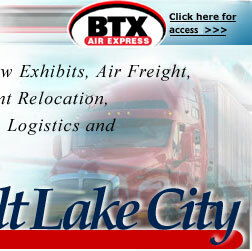 © Copyright 2001 - 2006, BTX Salt Lake City Transportation Logistics Solutions. All rights reserved.